Camp de Mar was once the unattractive sister of neighbouring Port Andratx, although it had a beautiful beach around which some apartments had been built there was no real centre and so it had little to offer. However, Camp de Mar has completely changed in the last 20 years and is now equally popular with tourists and those looking to buy real estate alike. With the development of this prestigious golf course new properties were built close by in the form of attractive residences with apartments and small villas, as well as residential areas with a sophisticated international clientele e.g Claudia Schiffer. Minkner & Partner, one of the leading providers of real estate in the region, has the most beautiful apartments as well as townhouses and villas (especially in the residences of Porto de Mar, Aldea del Golf and Colina del Golf) on offer in Camp de Mar. Camp de Mar is popular due to its large white sandy beach which slopes gently into the sea, and its preferred golf course. The beautiful bay boasts a far-reaching sea view and a small wooden bridge leads from the beach to a restaurant at the end of a pier. In the resort there are now various small shops for daily needs and holiday supplies, as well as some cafés and restaurants. Several hotels have also been built close to the beach. The most prestigious is the 5-star Hotel Steigenberger Golf & Spa Resort. And last but not least, the 18-hole golf course set in the undulating landscape. Camp de Mar is best reached via the motorway that connects Palma de Mallorca with Porto Andratx. To the east is the neighbouring town of Paguera, and to the west Port Andratx. Both places offer a comprehensive choice of bars and restaurants and plenty of shops, as well as all necessary services ranging from doctors to banks. Paguera is somewhat simpler and more touristy, Port Andratx is more refined and elegant. The choice is yours. If you are interested in buying an apartment or villa in Camp de Mar, please contact Minkner & Partner in our Pto. Andratx office - the specialists for real estate on Mallorca. 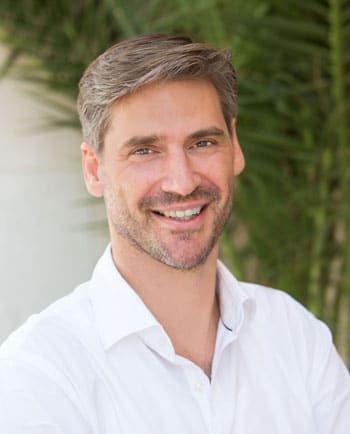 Florian Meister has been a professional real estate agent in Germany for the past 20 years and now enriches Minkner & Partner’s knowledgeable team with his expertise. He has been trained in and studied the real estate and housing industry and is a real estate business administrator as well as a certified appraiser for property valuation. All this expertise led to his success in Germany in real estate management and consulting. Florian works in the Minkner & Partner branch in Pto. Andratx. You can reach him on +34 971 671 250 or send us an email.